Grandfather clock chains are part of the weight mechanism within a clock. They may become tangled or may need to be replaced if the chains are broken, faulty or antique. The chains are an integral part of a Grandfather clock because they enable the clock weights to function and work in a synchronized fashion with the inner mechanisms of the clock. A Grandfather clock should have all the parts adjusted once the new chains are changed. Separate parts of the Grandfather clock may need to be adjusted before the weights and chains are put into place. Level the Grandfather clock in its permanent spot. Grandfather clock mechanisms are extremely sensitive, especially the pendulum and inner chimes; adjust it in the spot where it will rest and don't move it after hanging the chains. Adjust the clock by placing a level alongside the cabinet section of the Grandfather clock, or by screwing the corners of the back of the clock to a wall or level board. Check that the clock is square on the floor -- and especially on the carpet -- so it will not tip over. Adjust the pendulum before hanging the weights and chains. Open the side or front door of the clock to access the pendulum. 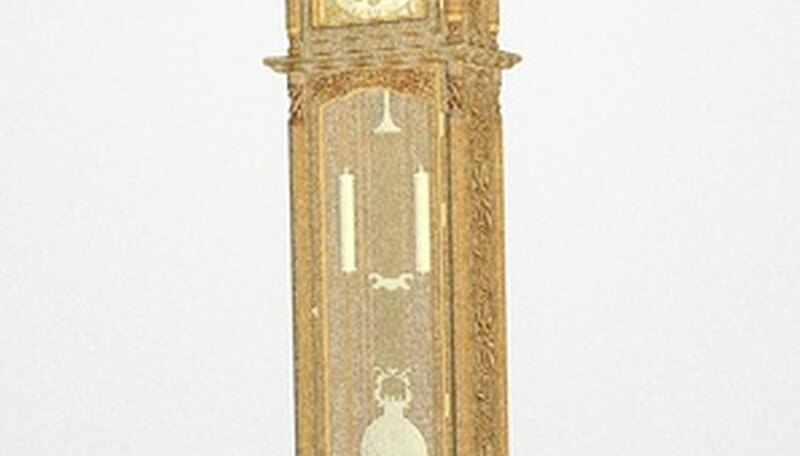 The pendulum is generally located in the front, usually behind glass. Use the small pair of pliers to carefully open the clock casing, if necessary. Stop the pendulum from swinging by gently grabbing the end of the pendulum and holding it still. Remove the pendulum from the pendulum hook. Place the pendulum to the side. Hang weighted chains after removing the pendulum. Look for the markings at the bottom of the weights. Chain weights will be marked "left," "right" and "center." Hang the chain weights accordingly. Make sure the chains do not become tangled. Hang them by attaching them to the cable pulley located up inside the clock. Make sure the cable is also in the cable pulley or else the weights will not work properly. Reattach the pendulum once the chain weights are hung. Start the pendulum swinging by pushing it either to the left or to the right. Set the moon dial on the clock face. The time must be set in order for the chimes to work in conjunction with the rest of the clock. Apply light pressure to the front section of the moon dial, which is located in the center of the clock face. Rotate the dial counterclockwise until the dial is directly below the 15 on the Grandfather clock. Move the moon dial carefully -- never force it. Set the time on the clock by winding the big hand counterclockwise. Wind it around only one time. Wait for the chime to sound.